Welcome to the best in view, atmosphere, comfort and location. Hazy Daze is an original Blowing Rock Lodge that overlooks John's River Gorge from an elevation of 3,500 ft. Cool Breezes, upside down snow, and crystal clear multi mountain range views are a daily captivating show from this 3 bedroom 3 bath spacious one level retreat. 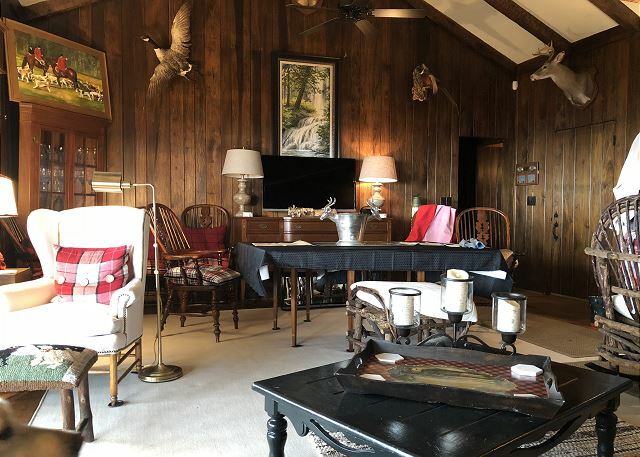 If your plans include extra entertainment this property is just minutes from downtown Blowing Rock, the Blue Ridge Parkway, and Appalachian Ski Mountain. Relax and enjoy everything the High Country offers in a true vacation. Very private setting just minutes from the best restaurants,Main Street shops, and all the hiking, fishing and horseback riding at the Moses Cone Estate offers. Handsomely decorated great room with an elk stone wood burning fireplace, cathedral ceiling, beautiful antiques, leather furniture and cozy accessories. Plenty of reading light, flat screen TV with cable, internet for that occasional rainy day. Dining table with seating for 6. Well appointed kitchen with dishwasher, microwave, cozy sitting area for morning coffee. Master bedroom with king size bed, views from every window, ceiling fan, private bath with a tub shower. Guest bedroom with 2 twin size pencil post beds, chestnut paneling with plenty of windows, hall bath with a large tiled shower. Wake up to a gorge view in the second guest bedroom with king size bed and chestnut paneling. Large covered deck with picnic table, willow furniture and rocking chairs, gas grill. Full mature native rhododendrons surround the house adding to the mountain charm.